If you suffer from an aching, irritating diabetic ulcer, and are even embarrassed with how it looks cosmetically, fortunately there are several solutions. But before we dig into what those solutions may comprise, it is important to have a solid foundation on what diabetic ulcers are, their causes, how to combat them and most importantly, diabetic foot ulcer treatment. The bad news is. essentially, you’re at risk if you have one or more of the following: neuropathy, poor circulation, foot deformity (like a bunion, hammer toe, wear inappropriate shoes, uncontrolled blood sugar or a history of a previous foot ulceration. The good news is, in many of these instances, diabetic ulcers can be prevented by following a diet and lifestyle that increases blood flow, lowers blood sugar levels and reducing friction and pressure. Try eating healthily, make food from scratch rather than shop-bought sauces high in sugar and salt, and look into Ayurveda. 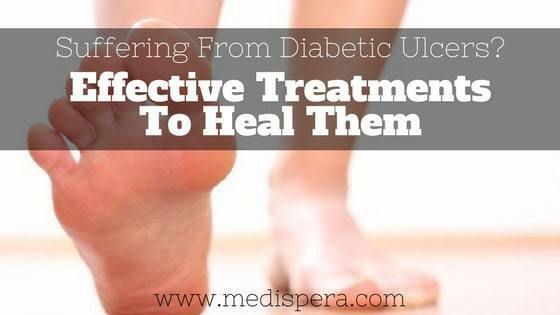 If you do find yourself in the unfortunate situation of having diabetic ulcers, fortunately there is diabetic foot ulcer treatment. While surgery may be inevitable, it’s important to try your hand at the following non-invasive methods. In most cases, many people with diabetic ulcers can tackle the problem at home. Many effective treatment options now exist, such as negative-pressure wound therapy (NPWT), also known as ‘VAC Therapy’, a therapeutic technique using a vacuum dressing to promote healing in acute or chronic wounds and enhancing the healing of second and third degree burns. By applying a continuous vacuum, the blood flow is increased in the area of the wound, drawing out excess fluid from it. Depending on the wound type or location, the vacuum can either be applied continuously or intermittently. Negative pressure wound therapy can be used for a few days to several months at a time. Other methods include the use of blasts of ultrasound, in a clinical setting, helping ‘stubborn’ chronic wounds to heal more quickly, as reported by the BBC almost two years ago. A new device, known as the WoundShield*, delivers low frequency therapeutic ultrasound, either in a clinical setting, or in the privacy of your home. As always, it is important to consult your doctor first before making any drastic changes. At the very least, if you think the following methods would be effective for you and your diabetic ulcers, discuss this at your next visit to your GP or consultant. Technology has made huge advances in recent years – especially in diabetes care. As mentioned above, the WoundShield low frequency therapeutic ultrasound emitting device is an industry leader, providing those with painful, exposed diabetic ulcers an opportunity to heal faster. This device is truly going to change the way we look at diabetes care. It sounds technical, but it’s actually pretty simple. To sum up the features of the WoundShield, it essentially transmits ultrasound waves into the affected area. These ultrasound waves are low grade, and are used for an extended period. One of the best features of the WoundShield device is that it is completely portable – it can be used at any time, wherever you are. Whether you place it on your foot while you work at your desk, read the newspaper, watch TV, or while you sleep, you can be healing your chronic wounds at your convenience. The WoundShield accelerates wound and soft tissue healing, improving the local blood flow, increasing the wound oxygenation and fibroblast migration and epithelial regeneration via a ‘slow-release’ ultrasound ‘hands-free’ therapy and can be used in conjuction with NPWT. It is placed adjacent to the wound so it does not interfere with the wound dressing and topical creams. It also affords an effective anti-biofilm therapy and decreases wound pain. The gold standard for offloading foot wounds in people with diabetes is total contact casting, however, recent studies have shown the modality is seldom used in the current clinical setting. Other offloading devices include removable cast walkers, half shoes, healing sandals, and, more recently, lightweight, rapidly custom-built braces. There are various ways to apply pressure to the ulcer and utilize the off-loading technique with various types of shoes, walkers and sandals. These strategies have produced great results as they allow the area to heal at an accelerated rate. When it comes to treating diabetic ulcers, it is important to strike a balance (as with most things). The most effective way for you to combat diabetic ulcers would be for you to ensure you follow a healthy diet, reducing sugar intake, exercising several times a week to increase blood flow and overall fitness, and not letting ulcers fester by starting treatment using any of the above-mentioned methods, or combination of methods, before the wounds turn nasty and fester. *The WoundShield is sold in Bahrain, Iran, Iraq, Kuwait, Oman, Qatar, Saudi Arabia, and the United Arab Emirates via MediSpera.